The luster of the silver hour markers, hands, numbers, and the hi-tech white ceramic on this watch, along with the gorgeous design of the face, makes this the watch that you absolutely must see and is one that you will instantly fall in love with once you do. Telling precise time is what you can expect from this luxury Cirros Milan unisex watch thanks to it's Japanese quartz movement, very visible silver hands, including a second hand, large silver numbers and hour markers, and the seconds markers. The numbers 12, 8, and 4 are printed on the dial of the watch. The other numbers are represented via hour markers. In need of the date? There is no need to pull your cellphone out of your pocket or purse or to ask someone for the date, because it is on the watch above the six hour marker. Concerned about water ruining this gorgeous must have watch? Don't be, because it is water resistant to 3 ATM / 30 Meters / 99 feet. Scratches on the dial are also another thing that you don't have to be worried about due to it's sapphire crystal, the most scratch resistant crystal among the three common crystals of mineral, acrylic, and sapphire. Sapphire crystal is the most expensive and durable of the three common crystals and is approximately three times harder than mineral crystals, and 20 times harder than acrylic crystals. 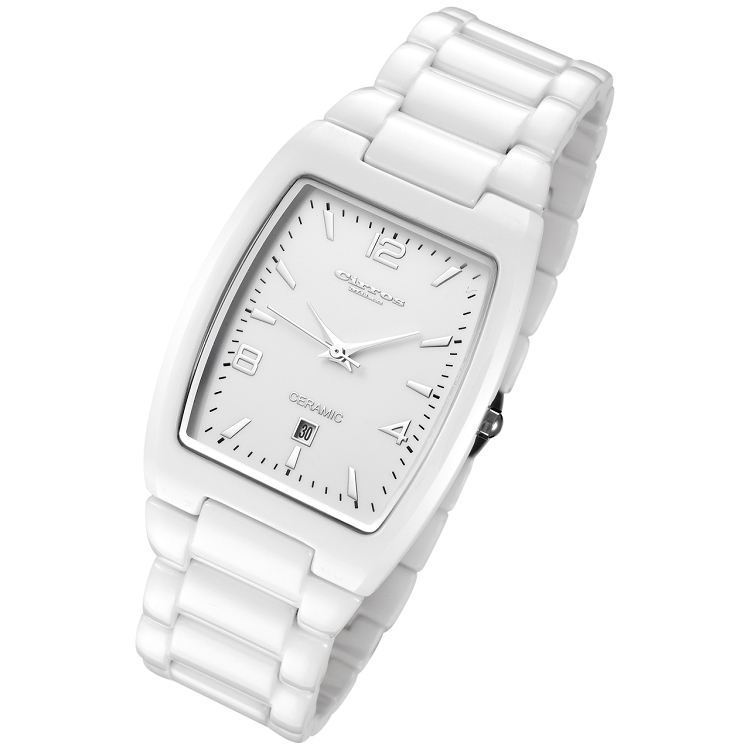 This white ceramic watch comes in one size and is made to fit a wrist with a circumference of 216 mm / 8.5 in, but it can be resized to any wrist. When seeking an affordable, gorgeous, luxurious, feature-rich ceramic watch with the date and precise timing, this is the watch that you will want to showcase on your wrist and to everyone you come in contact with. Finally, but definitely not least, rest assured that you can wear this watch with confidence and peace of mind because Cirros Milan backs it with a 1 year international warranty.